Confusion often arises about Archbishop Marcel Lefebvre's 1988 consecration of four bishops without papal permission, which action Pope John Paul II pointed out carried with it the latae sententiae (automatic) penalty of excommunication. However, according to canon law, a person who believes, like Archbishop Lefebvre did, that there is a moral necessity to break a law (i.e., for the salvation of souls) would not incur any automatic penalties, even if that person were to be incorrect in that assessment. Archbishop Marcel Lefebvre, experiencing failing health, aware of his episcopal duty to pass on the Catholic Faith and seeing no other way of assuring the continued ordination of truly Catholic priests, decided to consecrate bishops and announced that, if necessary, he will do so even without the pope’s permission. June 30, 1988, "Operation Survival". Cardinal Gantin, Prefect of the Congregation for Bishops, officially warned the archbishop that, in virtue of canon 1382 (1983 Code of Canon Law), he and the bishops consecrated by him would be excommunicated for proceeding without pontifical mandate and thereby infringing the laws of sacred discipline. 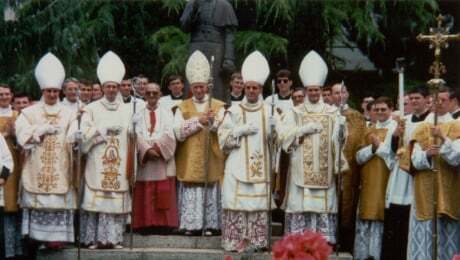 Archbishop Lefebvre, together with Bishop de Castro Mayer, consecrated four bishops. Cardinal Gantin declared the threatened excommunication (according to canon 1382) to have been incurred. He also called the consecrations a schismatic act and declared the corresponding excommunication (canon 1364 §1), as well as threatening anyone supporting the consecrations with excommunication because of “schism". In Ecclesia Dei Afflicta, the pope repeated Cardinal Gantin’s accusation of schismatic mentality and threatened generalized excommunications (cf. question 12). and if one culpably thought there was a necessity, he would still incur no automatic penalties (canon 1324, §3; §1, 80). No penalty is ever incurred without committing a subjective mortal sin (canons 1321 §1, 1323 70). Archbishop Lefebvre made it clear that he felt bound in conscience to do what he could do to continue the Catholic priesthood and that he was obeying God in going ahead with the consecrations (Cf. the Sermon of June 30, 1988, and Archbishop Lefebvre and the Vatican, p. 136). Hence, even if he had been wrong, there would be no subjective sin. Most importantly, positive law is at the service of the natural and eternal law and ecclesiastical law is at that of the divine law (principle 8) No “authority,” [principle 9] can force a bishop to compromise in his teaching of Catholic faith or administering of Catholic sacraments. No “law,” can force him to cooperate in the destruction of the Church. With Rome giving no guarantee of preserving Catholic Tradition, Archbishop Lefebvre had to do what he could with his God-given episcopal powers to guarantee its preservation. This was his duty as a bishop. Finally, the Church’s approval of the SSPX (question 2) allows it what it needs for its own preservation. This includes the service of bishops who will guarantee to maintain Catholic Tradition. Is there a state of necessity in the Church today? FAQ video sidebar: 03-2 Who was Archbishop Lefebvre?